Ever since the warm weather has arrive I've moved my "office" onto the balcony. One of the nice things about doing your own research is that you can do most of it at home and I only go in to my actual office 2 or 3 times a week when I have something to do. Interestingly I've found that my productivity (measured by how much I read and write) has actually increased quite a bit since I started working outside. I think this is because there are fewer distractions out there and usually I just turn the computer off and leave it inside unless I need to use it. Last year when we lived in the dark, ugly Kaikan I ended up getting way less work done on nice days because I always wanted to go outside to enjoy the good weather. 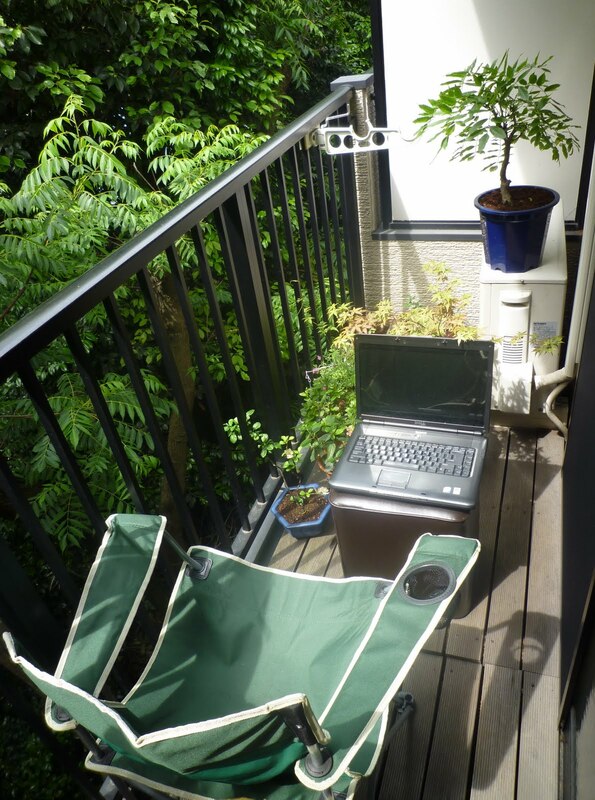 This way I can both enjoy the weather and get work done - the perfect combination! 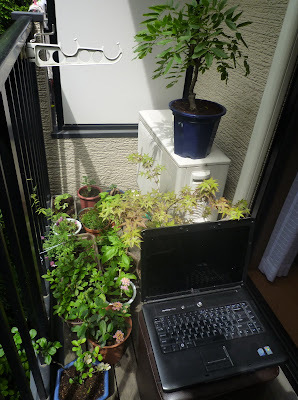 As an interesting aside about Japanese culture I should mention that setting up a chair on your balcony like this is considered a bit unusual over here. Balconies of this size have a strictly utilitarian purpose: they are a place to hang your laundry to dry and store your air conditioning unit and nothing else. This is what everyone else in the building uses theirs for, despite the wonderful views the balcony affords. I have to admit that it took me quite a bit of planning to set this up like this AND still be able to use the balcony for laundry drying purposes. In the end though all it really took was an 800 yen portable clothes rack that I can fit behind the green folding chair. It only takes up about 20% of the space but is big enough to hold a typical load's worth of laundry.